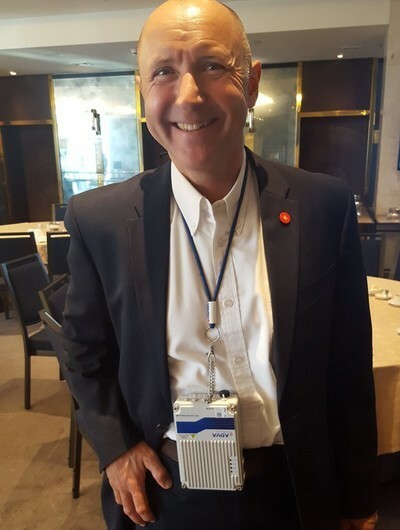 ADVA is making its bid to play in small cell backhaul, introducing a temperature-hardened device it claims to be the industry's smallest. Acting as a demarcation device, the new product series taps ADVA Optical Networking (Frankfurt: ADV) 's expertise in the Ethernet space, acquired with its Overture buy and the more recent MRV acquisition, and its longstanding optical networking capabilities, says Stephan Rettenberger, senior vice president, marketing and investor relations, for ADVA. The expectation is that service providers who have rights-of-way will build out fiber networks and offer those services on a wholesale basis to wireless network operators and others in the retail service space. Working with its existing customers, ADVA developed the outdoor device to meet their requirements, including environmental hardening, the ability to function without built-in cooling, addressing of Layer 2 and Layer 3 services, highly precise time and frequency synchronization and automated testing and in-service monitoring as well -- essentially taking what is delivered on-premises today and packaging it for this new environment. "Customers gave us those scenarios where they want to install these devices, and two different key requirements came out of that for the edge of the network," he says in an interview. "They needed a device that is environmentally hardened. One needed to be compact, so it can be mounted inside a pole, for example, and there is a slightly larger device that it is even better sealed and this is for scenarios where the service provider isn't even sure if the area might be subject to flooding." Cost-effectiveness is another issue, given how widely deployed the devices may be. The ADVA FSP 150-GO102Pro devices, which are currently in trial, meet those cost requirements, he says. The devices are now generally available. In addition to sophisticated hardware-based network syncing, ADVA also is supporting bandwidth slicing and virtualization of the complete network, says Ulrich Kohn, director, technical marketing, ADVA. "Service providers with 5G are going to virtualize the complete network, with network slices with specific capabilities, characteristics and performance parameters for special customer groups. They are also going to want to virtualize the connectivity network and this is why we have implemented programmatic interfaces for SDN control to completely segment virtual connectivity slices." Those interfaces are Netconf/Yang-based, Kohn said.